Malaysian accomplished electric violinist, Dennis Lau is set to have his first ever large scale concert on 22 October at the Mega Star Arena, featuring an all-star Malaysian talents who have previously collaborated with him over the years. Lau will also be unveiling his grand masterpiece, the one and only – The Phoenix Violin at his highly anticipated “Dennis Lau & Friends, The Phoenix Rising” concert. The 23k gold plated and diamond studded Phoenix Violin is handcrafted by renowned Irish instrument maker, Alistair Hay, who has produced instruments for world-famous musicians like Steve Vai and Wang Lee Hom. “The phoenix is a respectable symbol, I envision new ways to inspire the younger generation in music and to showcase the diversity of the instrument,” said Dennis Lau. Some of the local stars who will be performing on stage together with the internationally renowned violinist include Ning Baizura, Syafinaz Selamat, Soo Wincci, Vince Chong, Russell Curtis, Atilia Haron and many more. 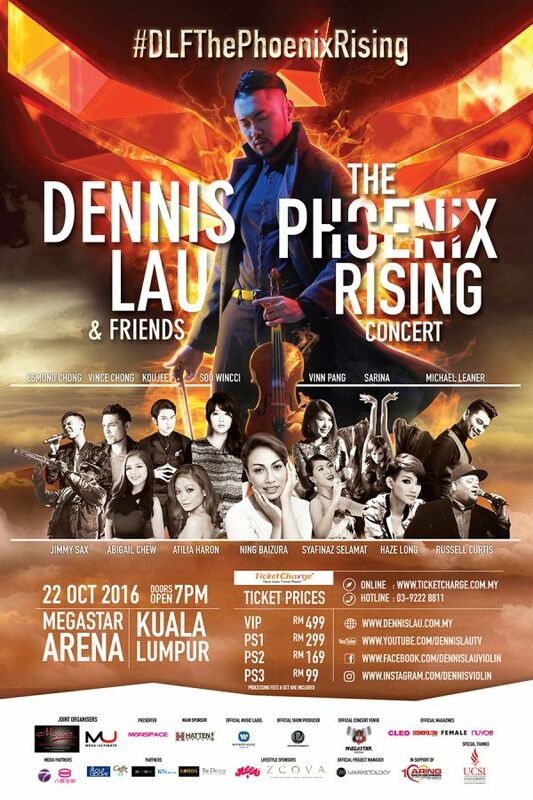 Tickets for “Dennis Lau & Friends, The Phoenix Rising” concert are priced at RM499, RM299, RM169 and RM99, and can be purchased via ticketcharge.com.my.